ISBN 0739043323. 9x12 inches. English. Transcribed by Stefan Grossman. The Early Masters of American Blues series provides the unique opportunity to study the true roots of modern blues. 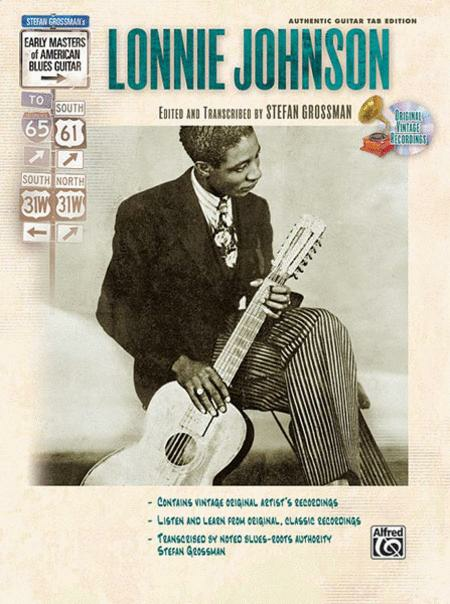 Stefan Grossman, noted roots-blues guitarist and musicologist, has compiled this fascinating collection of 16 songs, transcribed exactly as performed by legendary blues master Lonnie Johnson. In addition to Stefan's expert transcriptions, the book includes a CD containing the original recordings of Lonnie Johnson so you can hear the music as he performed it. One of the most influential blues artists of the 20th century, Lonnie Johnson began his 50-year music career in the early 1920s, and continued to perform and record until his passing in 1970. Recording both as a soloist and with legends like Louis Armstrong, Duke Ellington, and Eddie Lang, Lonnie Johnson's influence can still be heard today, from the work of blues guitar greats like T-Bone Walker and B.B. King, to a whole new generation of blues players.